The AVOX 4 Vocal Toolkit combines 11 of Antares' state-of-the-art vocal processing plug-ins to give you the power you need to create stunning vocal tracks in any musical style, and design unique vocal effects for audio post-production applications. All at a substantial savings over purchasing the plug-ins separately. AVOX 4 requires an iLok (not included). â€¢ Pro Tools 10.3.8 or later. â€¢ Mac OS 10.9.5 to 10.13 as required by your version of Pro Tools. 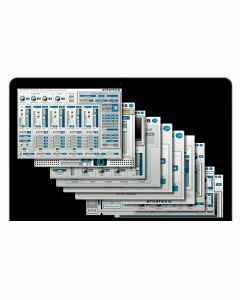 â€¢ A compatible VST host program that supports the VST3 format. â€¢ Mac OS 10.9.5 to 10.13 as required by your host. â€¢ A compatible host program that supports the Audio Units format. â€¢ Mac OS 10.5.8 to 10.9.5 as required by your version of Pro Tools. â€¢ Windows 7 to 10 as required by your version of Pro Tools. â€¢ A compatible host program that supports the VST2 or VST3 format. â€¢ Pro Tools 8 â€“ 10.
â€¢ Windows XP, Vista, 7, 8, or 8.1 as required by your version of Pro Tools.